THE Government will soon airlift aid to stranded communities after widespread flooding left one person dead, extensively damaged roads and destroyed bridges, leaving parts of the country isolated. The Ministry of Environment, Water and Climate recommended in a statement issued through the Meteorological Services Department (MSD) yesterday that in view of the destruction caused by the floods, a state of disaster be declared in the affected provinces. The Bulawayo-Masvingo Highway was yesterday closed to traffic after Nkankezi Bridge situated on the highway in Filabusi collapsed. The bridge gave in to raging waters after Sukasihambe Dam, about 20km upstream burst its wall on Sunday night, flooding Nkankezi River. 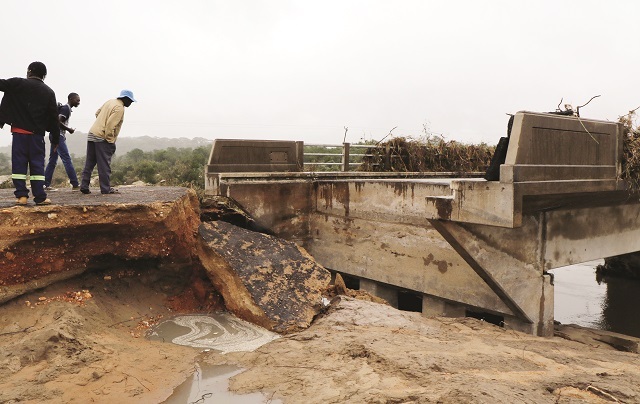 On Thursday communities living between Filabusi and Mbondweni in Insiza South constituency were cut off from each other after a bridge in Kalna area was swept away by floods. Insiza South MP, Cde Malaki Nkomo said yesterday that people in his area were now travelling for 200km via West Nicholson to access an area which is 30km away. Thirteen families in Denga and Nzviyo villages under Chief Madyangove in Chivi near Mashava and nine Zimbabwe National Water Authority (Zinwa) employees spent four hours marooned, some on tress as the flooded Shashe and Musavezi rivers spilled to their homesteads, police confirmed. The Zinwa employees were marooned while working at Gaths Mine pump station in Mashava and they had to be rescued by the police sub-aqua unit from Buchwa Mine, Zvishavane. The Minister of Local Government, Public Works and National Housing, Cde Saviour Kasukuwere, said some southern parts of the country were receiving up to 200mm of rain in 24 hours. He said more communities are likely to be marooned due to continued rains while drowning incidents are on the increase. “A number of communities have been marooned and more are likely to be marooned as the rainfall is expected to be sustained for the rest of the season. Incidents of drowning are on the upsurge,” said Minister Kasukuwere. The Minister said one person died in Bikita due to a landslide while 21 were airlifted in the Midlands. He said infrastructural damage has resulted in many communities being cut off their areas of supplies. “A combination of flooded rivers and damaged bridges has constrained access to services for some communities particularly parts of Insiza, Mberengwa and Gwanda. Plans are afoot to airlift supplies for severely affected parts of the country,” he said. Villagers yesterday told The Chronicle that it was a miracle no one died when Nkankezi Bridge was swept away. They said a three-metre high wave separated the road and the bridge, uprooted trees and telephone lines, tore the tarmac, swept away a Mercedes Sprinter and its trailer leaving passengers stranded at about 10PM on Sunday. Passengers who were in the Sprinter, travelling from Zvishavane to Beitbridge said they sensed danger and jumped out of the vehicle, leaving their luggage in the trailer, after they heard a loud noise of trees being uprooted by the powerful wall of water minutes after they arrived at Nkankezi Bridge. They watched from a distance as the vehicle was swept away. When Chronicle arrived at the scene, public transporters from Mutare, Masvingo and Zvishavane were parked on the eastern side of the damaged bridge. They were exchanging passengers, who were being assisted to cross the flooded river by villagers on a dicey-looking footbridge, with those coming from Bulawayo, Gwanda and Beitbridge. Private motorists intending to travel to Zvishavane from Bulawayo had to go via Gweru while those travelling to Beitbridge from Zvishavane were going via West Nicholson. Insiza North MP, Cde Andrew Langa said the damaged bridge has brought business to a halt and schoolchildren cannot attend school. “I am at Nkankezi right now with the local community and personnel from the Ministry of Transport and Infrastructure Development to try and clear the old causeway bridge so that vehicles can pass. It is against this background that we appeal to well-wishers and non-governmental organisations to assist in every way possible. We are however confident that Government will react swiftly to this problem,” said Cde Langa.